Following Vostok 1, in August 1961 Titov spent an entire day in space in Vostok 2. The following August (1962) Nikolayev in Vostok 3 and Popovich in Vostok 4 flew a joint four-day-long mission. In 1963 Bykovsky set a 5-day endurance record. 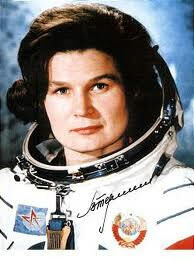 Also in 1963, Valentina Tereshkova became the first woman and first civilian in space in Vostok 6. Tereshkova had worked the assembly line of a textile factory but was recruited into the female cosmonaut program for her skill as a parachutist. When the dissolution of the first group of female cosmonauts in 1969, she became a prominent member of the Communist Party. She has spent her life as a hero of her country. In 1964 Voskhod 1 carried the first group mission into space in a VERY crowded capsule. In 1965 Leonov made the first spacewalk in Voskhod 2. Meanwhile, the Americans had been busy thanks to the energy and resources brought to the space program by President Kennedy.